Tyre24 is a trademark of SAITOW AG, based in Kaiserslautern. It has a market of about 2,000 manufacturers, wholesalers and retailers from all over Europe. 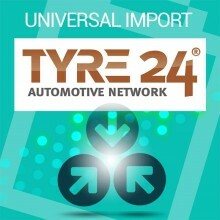 Dropshipping Tyre24 offers a wide range of items, for a total of more than 10 million tires. The module is designed to safely connect to Tyre24 server to collect and process the CSV file and acquiring the automatic synchronization option, manage updates at regular intervals. Importing associate product images by reading from the CSV file. The import will create products with all available data from the trace data. Producers are correctly handled and imported in Prestashop. The eco-tax is handled and imported in the "tax involving" field. You 'can specify up to 4 values ​​of PFU to be associated with the relevant product categories through a dedicated CSV file. The products are divided into different categories according to their identification code. The script divides the products for "Moto" / "Car" / "Truck" / "Agriculture" etc. The categories are editable and customizable on first installation. The Base version includes 3 months of service without updates. The Premium version includes installation, initial configuration and 3 months of service. To get 12 months of support and upgrades you can purchase the ZEN option. The user license is unlimited to a single domain, and there are no annual fees. On the demo site search module "Universal Import". On "catalog selection" select "Prestalia Tyre 24"